“Single original owner. 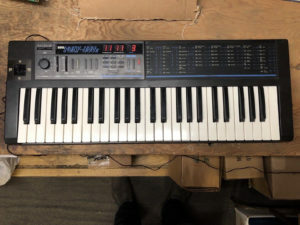 Used over a two month period in 1986 for a total of 28 hours. Tested all keys, switches, dials, I/O and filters — working perfectly. “Please look carefully the photograph before your buy. 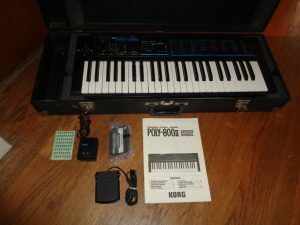 “- Selling my personal Korg Poly-800II that has been recently COMPLETELY!! refurbished by Number One Vintage Keyboard Repair Company in New York City – The Analog Lab, New York. – Original factory Sound Library was reinstalled. – The repair cost was almost $200.00 – they did a top-notch work. I have a copy of the receipt. All works as it should 100% and the keyboard plays beautifully. – There are some minor cosmetic issues, but nothing major. – Just as I said – all works amazingly very well. Just serviced by us ( Shoreline Electronics & Sound ) – Everything works 100 % – Big FAT analog sounds !!! 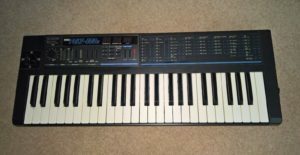 “Korg Polly mk2 with Moog slayer mod. Comes fully working. Generally the condition is good but, it is old and does have signs of use. There is also a faint postcode that has been written with what looks like a security marker pen, but is hardly noticeable. It has the Moog slayer mod fitted. Filter and resonance pots. This thing is a beast and it is advised that you used a limiter as you could damage your speaker (or your hearing) if it’s played really loud. But you have the ability to dial it back so it’s not so crazy. 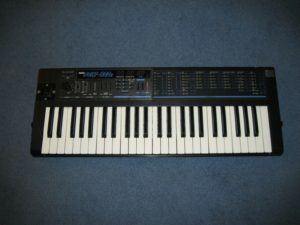 “Korg Poly 800ii synthesizer. Amazing sounds. Selling because I want something I can use live, and have easy control over cutoff etc. Comes with power supply, not original power supply but a multi voltage power adapter. “Good working condition, a few scuffs and scrapes. Comes with original power supply. 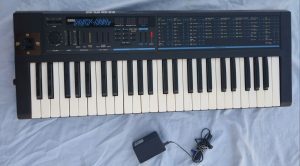 “Korg poly 800 II vintage sytnthesizer. Small amount of disturbance on couple of keys. Comes with a/c power adapter. 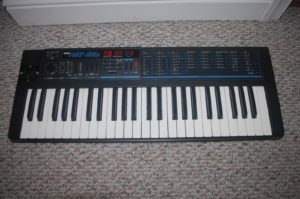 “Don’t know much about this keyboard exvept that I have the original Korg adapter with it and it powers up. It has a broken key (that apparently can be easily ordered and replaced). Other than that, all looks great! So, I decided to give it a chance. Its gonna cost a bit to ship because of the size and weight of it (that, I have no control over) so, the shipping will be the biggest issue. 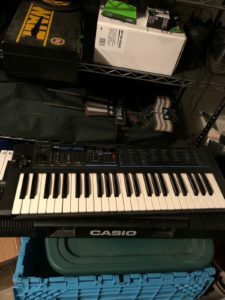 Im starting the auction very cheap and not looking to get rich off of this, just give somebody a chance a obtaining a vintage keyboard synthesizer that was once very highly sought. 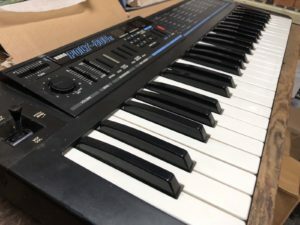 “In Excellent working order – Includes original manual (manual has some writing in it and discoloration) and original power supply in great shape. Comes with “hybrid” case. Has some scuffs on the back and here and there, a little wear around on knob – see pictures but really excellent and tested. 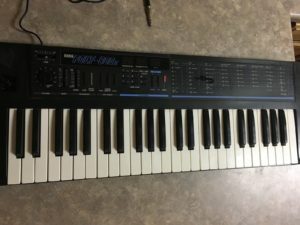 “Korg Poly 800 II w/ power adapter. Works flawlessly, except for one key in the higher register. 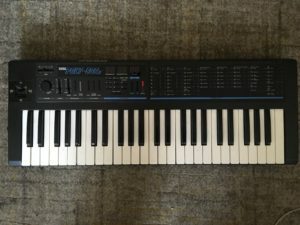 “Verkaufe Korg Poly 800 Mk 2. 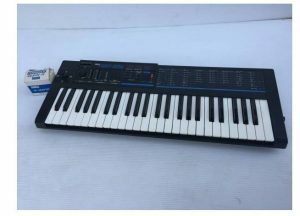 Synthesizer funktioniert, es klemmen aber 3 Tasten, daher als Verkauf als defekt. 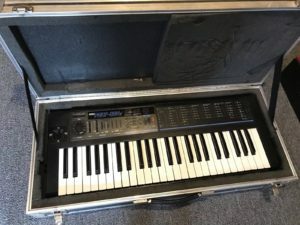 Habe den Synth nie so richtig verstanden und unter Kontrolle bekommen. Er hat manchmal einen seltsamen Aftertouch auf den Tasten, wie eine Art Modulationseffekt (Habe nie gefunden, was das sein könnte), deswegen habe ich ihn bisher für fette Flächen und warme Bässe einfach per Midi angesteuert.